The Tonno Pro Tonno Fold Premium Vinyl Tri-Folding Tonneau Cover has become the fastest growing cover in it's class! And for good reason. The hinged together sections make it easy to fold it into a more company unit. You can remove it in seconds when you have oversized cargo or simply fold it forward to lock in place for smaller loads. The Tonno Fold Tonneau Cover comes completely assembled – NO DRILLING! This makes installation of your truck bed cover a breeze. The Tonno Pro Tonno Fold Premium Vinyl Tri-Folding Tonneau Cover is unmatched in quality. It features tear-resistant Double Sided Vinyl, and a 6063 Grade Powder Coated Aluminum Frame. Both are covered by the industry's best warranty. Not only does the Tonno Pro Tonno Fold Premium Vinyl Tri-Folding Tonneau Cover provides you the protection and functionality you need, but it does it with the a Low Profile Styling that will look great on any Truck! Plus it can Save you Gas and keep your Truck looking great for years to come! Double Sided Vinyl with our proprietary black textured finish is tear-resistant and made from 24oz. material which the highest standard in the industry. Comes completely assembled and installs in less than 5 minutes. Snap Clip style fastening system which allows for safe and easy storage in the open position..
Un-matched and Industry Leading Warranty on the Frame, Clamps and Cover. E-Z clamping system for securing your cover and providing tension and security to the cover. Low Profile Design that results in Gas Savings from 10% to 12%. Applications for Chevy, Ford, Dodge, Isuzu, Lincoln, Mazda, Mitsubishi, Nissan, Suzuki, and Toyota Models. New improved front aluminum latch will secure the cover to the truck in extreme conditions. Easy to use quick connect straps hold the cover in the open position when you are driving. OE Grade Rubber Q-Seals help form a water resistant barrier, not the thin foam gasket found on other competing products. Mildew and Mold Resistant! Our 24oz Premium Vinyl is designed to protect against the elements for years. Quick clamps designed to help speed installation and operation of the cover. Easy clamps mean a 5 minute installation. High strength nylon corners designed to last and are impact resistant. Extra thick foam rubber corners designed to seal around bed liners and bed caps. High quality craftsmanship and finished components add to its value and style. Patented Slide Lock System is designed to make installation as easy as 1 – 2 – 3. 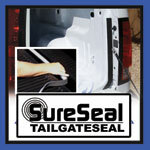 After Installation - Sure Seal tailgate seal will minimize dust and moisture in the bed of your truck. Heavy Duty, Tear Resistant exterior vinyl that is designed for outdoor use. Dual coated vinyl prevents mold and mildew and is recommended for extreme outdoor use.